A total of 30 players from Sweden signed an NHL contract before the 2017–18 season. The last time another European country produced more NHL players was more than eleven years ago. With some new Swedes on the block, we don’t know yet what they will make as the storyline of this season. But we can presume. In this list of Swedish rookie players for the 2017–18 NHL season, there are those who already have made their NHL debut. Others have been called up from the AHL and some even come straight from senior-level hockey in Sweden. Who knows…maybe a year from now one of these names has been handed the Calder Trophy. And even though the list of Swedish rookies will expand over the course of the season, it’s time to get a broader view of the present rookie class from Sweden. 2017–18 Season Projection: Why not start with the most plausible Calder Trophy winner on this list. The power-center produced seven points in 15 games with the Wild last season, and will probably not fall under those numbers this year. Can he only use his size and shot as he normally does, I’m saying he will make the Wild a much better team. And he’s bound to get more room to shine. 2017–18 Season Projection: Borgman is a chapter of his own. A year ago, no one could have guessed that he would be a top-six defenseman on the Maple Leafs roster. Thanks to his physical game, poise and confidence that’s now the case. With that being said, he is not in any way guaranteed a whole season with the Leafs. He’s still on a learning curve, but so far, he’s only improved his chances. 2017–18 Season Projection: Forsberg would likely have been an NHL goalie by last year if it wasn’t for the fierce competition with Sergei Bobrovsky and Joonas Korpisalo in the Columbus Blue Jackets system. Now he’s with the Blackhawks as the natural back-up to Corey Crawford. Forsberg’s big break should be on the rise, but of course, a first season in the NHL is nothing more than a first season. Still, it’s a relief to finally see Forsberg on the big stage. 2017–18 Season Projection: Quite surprisingly, Carlsson is making his case for the Blue Jackets. He got a taste of playing at this level already in the Stanley Cup playoffs last season. While it’s obvious that coach John Tortorella has a thing for the big Swede, we might not expect Carlsson to stay in the lineup for an 82-game season just yet. At the same time, there’s always room for a player like him. 2017–18 Season Projection: With Kempe you get an offensive upside that should get him mentioned as one of the most gifted young players in the league. That hasn’t always been the case. If we look at it through that lens, it’s beneficial for Kempe that the Kings are closing in on a rebuild. The goal-scoring forward deserves more hype. This will be the season during which he proves it. 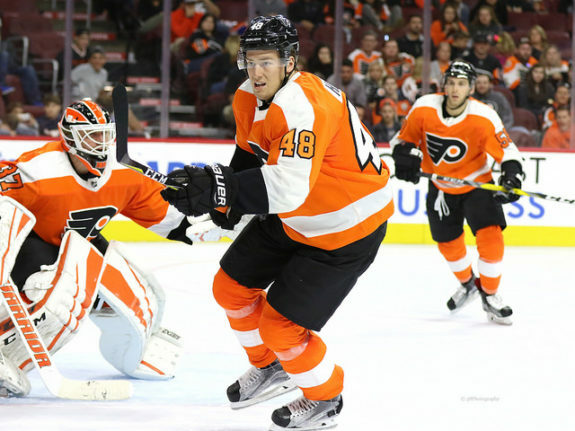 2017–18 Season Projection: Hägg has been in the pipeline as one of the Flyers’ most promising prospects ever since he was drafted in the second round of 2013. But the two-way defensemen has for some reason been having a hard time trying to knock himself through the roster. Until this year, that is. Hägg seems to finally get the trust to play in the NHL, and he looks ready for a full season with the Flyers. 2017–18 Season Projection: Coming from a season in the KHL, 26-year-old Fantenberg is possibly the most experienced rookie on this list. The defenseman has great all-around abilities and will make the Kings a better team everywhere on the ice. And don’t be surprised if you see a significant number of points coming from him. Fantenberg is here to stay. 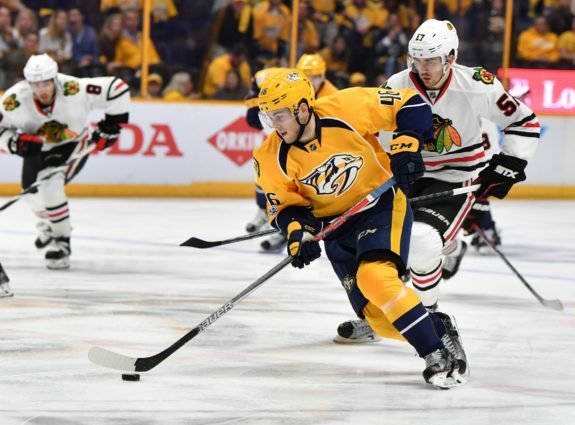 2017–18 Season Projection: Åberg came in as a successful injection for the Predators last season, and we all know how that went for them in the playoffs. But the second year in the NHL is often the toughest for a young player. Even though the energetic forward will have a lot to live up to, let’s not forget that Åberg still is quite new at this level. His biggest challenge will be to find consistency in his game. 2017–18 Season Projection: It’s almost strange to call Olofsson a rookie — this is his third consecutive season with the Wild. However, this will probably be the first in which he maintains a roster spot for a longer period of time. A smart defenseman, with a habit of getting on the scoresheet as well. 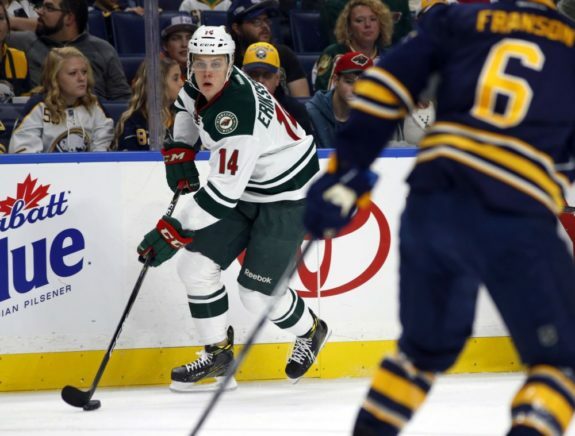 The only thing speaking against Olofsson would be that the Wild have an interesting set of defensemen, and he will have to excel his game to get more ice-time. 2017–18 Season Projection: If you want juicy shots from the blueline, go with Djoos. The offensive potential is big with this defenseman. A total of 58 points in 66 games in the AHL last season speaks for itself, but it will be interesting to see if Djoos can translate his impressive production to the NHL as well. He got off to a good start with two points in his debut with the Capitals. 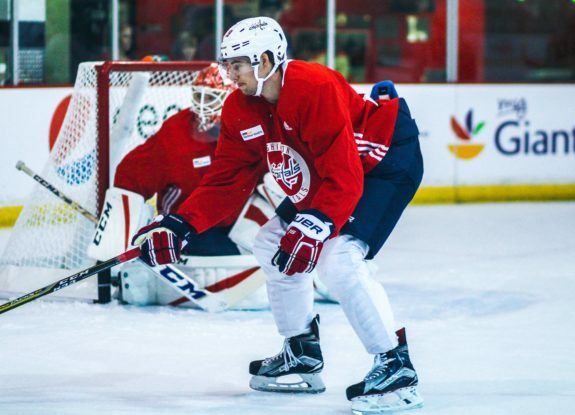 If he keeps it up, the Caps will have no choice but to include Djoos in the lineup this year. 2017–18 Season Projection: Sixth-rounder Jesper Bratt came out of nowhere up to this season. Suddenly, he’s been mentioned in Calder Trophy talks after an explosive start with the Devils. And while it’s been a pleasure to see him thrive at the beginning of his NHL career, we must not get ahead of ourselves. Bratt comes from the second tier in Sweden. He’s the latest drafted player to play in the NHL as a junior since 1996. But will he last over the 9-game mark? If so, will he play over 40 games this season? I’m not so sure the Devils are willing to let that happen. What’s your opinion on the rookies on this list? Who will have a breakthrough year? Who will be a bust? And is there, really, a Calder Trophy candidate from Sweden this season? Please, comment and share your thoughts!